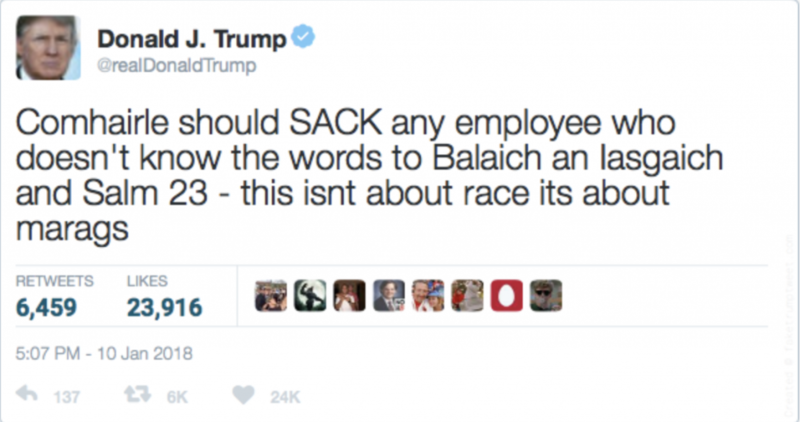 Did Donald Trump forget the words to Eilean Fraoich? Donald Trump has caused another major stir after seemingly forgetting the words to the chorus of Eilean Fraoich, the national anthem of his home planet of Lewis. Filmed at the fortnightly tatties and herring supper at Trump Tower, it shows the 45th President of the United States forgetting the words to the Leòdhasach anthem. The shocking footage can be found here. The Donald has made a big deal about people not just being able to sing along to the choruses but also at least the first three or four verses of a classic cèilidh song. He even live tweeted scathing criticisms of singers at last year’s National Mòd who stumbled over their words. “Even Crooked Hillary could get through the Traditional final without forgetting her words, and she’s a Gaelic learner as well.” he said in a tweet, subsequently deleted, supposedly in connection with the Russia investigation. A Taigh Geal spokesman said “The President himself prefers to allow the people who are paid to sing to do their job.” However, taking to Twitter, Mr Trump doubled down on his criticisms today, even in light of his own senior moment with the anthem.